With the pending release of the consumer version of the Oculus Rift and growing excitement about Valve’s VR platform, the virtual reality industry is set to come into its own. With the development of viable virtual reality platforms, VR is poised to become big business. A critical part of any tech industry is intellectual property. Any companies that want to be serious players in the VR space will have to have a handle on the VR IP landscape. Towards this end I will be undertaking a series of posts aimed to provide information about virtual reality IP issues. 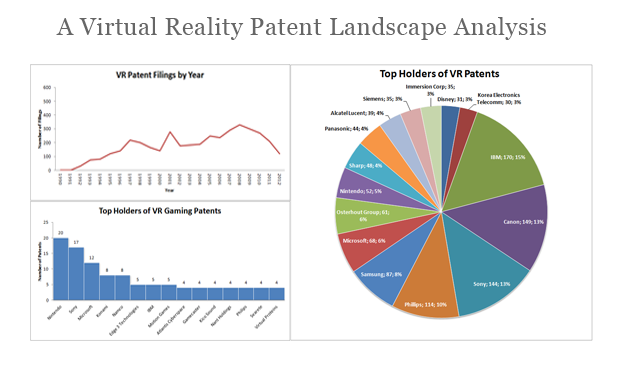 In this, the first of the series, I have attempted to provide a picture of the overall patent landscape of the virtual reality field in terms of the major patent holders, patent filings by year, top buyers of patent assets, and the top owners of gaming related VR patents. The data for this analysis comes from publicly available data provided by the U.S.P.T.O., and will therefore not take into account filings, holdings or other transactions that have been kept confidential. The analysis was conducted by searching the U.S.P.T.O.’s database using a combination of keywords, IPC codes, and U.S. classification codes. It is also worth noting that this analysis was done for virtual reality technology in general, which includes stereoscopic displays, head mounted displays, haptic devices, computer algorithms and tracking systems. The filing of virtual reality patents began in earnest in 1992 and saw a fairly steady rise until 2008 when the number of annual VR patent filings began to drop off. I won’t speculate about the reasons for this decline but it’s a good bet that the number of VR related patent filings will be on the upswing in the very near future. The fact that a substantial amount of the VR patent applications were filed more than 10 years ago suggests that many of these patents may be unenforceable due to failure to pay maintenance fees. As a result there may be substantial opportunities for open source virtual reality projects (which will be the subject of a later blog post). It should come as no surprise that some of the biggest names in tech are also the biggest holders of virtual reality patents. 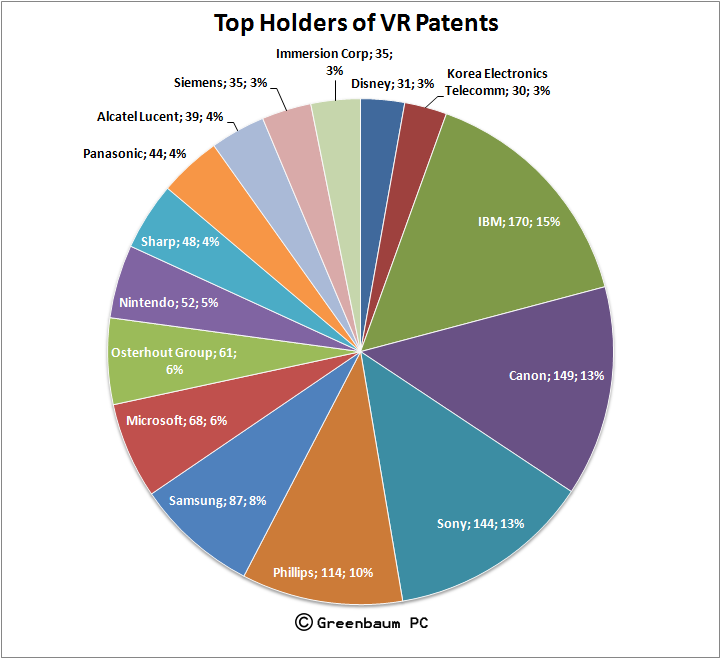 Namely, IBM, Canon, Sony, Philips, Samsung and Microsoft, which together account for about 65% of all VR patents. It will be interesting to see how these companies leverage their IP assets as the virtual reality industry grows. It is apparent that the first adopters of the coming VR technology will likely be gamers and the video game industry will be in the driver’s seat regarding the development of the space. As such the companies that hold gaming related VR patents will undoubtedly have a role in how the industry grows. Nintendo, Sony, Microsoft, Konami and Namco are key patent holders in the field of virtual reality gaming. Again, it will be interesting to see how these companies use their IP assets as VR becomes more mainstream. 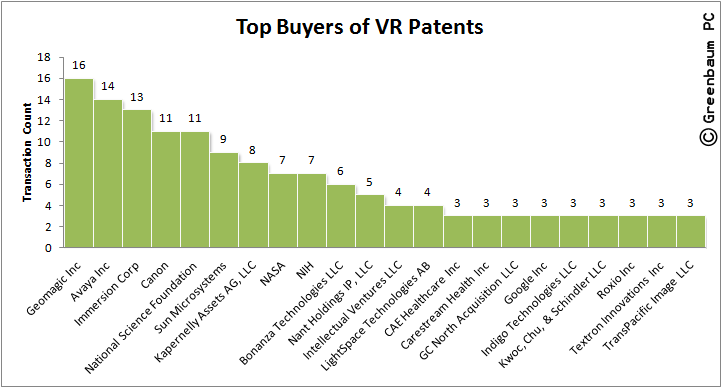 The graph above shows the companies that have acquired virtual reality patents (purchased or otherwise became the assignees of the patents) between 1993 and 2012. Sellers of patent assets include Sensable Technologies, Nortel, Virtual Technologies, and Mixed Reality Systems. At least one of the acquiring companies is a well-known Non-Practicing Entity (sometimes known as a Patent Assertion Entity or “patent troll”). In conclusion, the IP landscape of the virtual reality space tells an interesting story. Despite the fact that there has never been a truly successful commercial virtual reality platform, there are a surprising amount of VR patents and transactions involving those patents. This phenomenon will create both opportunities and liabilities for start ups and other companies looking to enter the industry. Works cited: Virtual Reality (VR) IP Assets: Commercialization Viability Analysis, Relecura Corporation, December 2012. A link to their white paper on the subject can be found here. The Greenbaum Patent Blog is the blog of Eric A. Greenbaum esq, founder of Greenbaum P.C., an intellectual property law firm located in Long Island New York. The firm focuses on patent and trademark prosecution, licensing and contract work for independent inventors, small companies and start-ups in New York City (NYC,) Long Island and around the country. Intellectual property law is a rapidly evolving field of law and the issues are very fact-specific. Nothing on this blog should be taken as legal advice. Consult with an attorney for help on your particular case. I am fascinated to see that SEGA JP is not down on your list – can you confirm they have no patents in this sector (they have been a significant developer of VR from the start), or if this was a omission because of their JP status? Great Report. 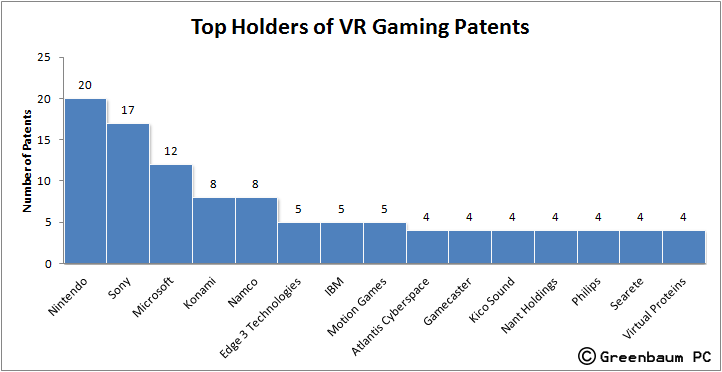 Sega does have a few patents in the VR space but they didn’t make the “top holders” list. The structure of the searches and the terms used may have influenced why they didn’t appear on the top holders of gaming patents list. Very nice work. Many thanks. I posted a link on the Patent Analytics discussion group on LinkedIn and Patent Buddy on Twitter.